Below are the pictures from the dyeing process. I did the black tea experiment in the evening and then left them to dry over night. The rooibos tea and chamomille tea experiment was made in the morgning. They were dry enough sometimes after the afternoon. 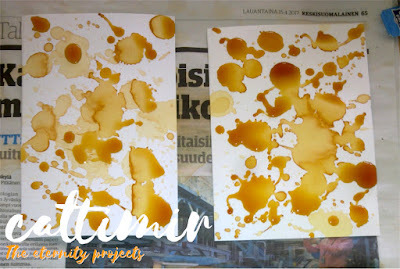 Some papers were dipped into tea and on some papers I sprinckled the tea with fingers or with a big watercolor brush. I broke some tea bags and put the wet loose tea on the papers. I did it only with the black tea. BLACK TEA on the mixed media papers. 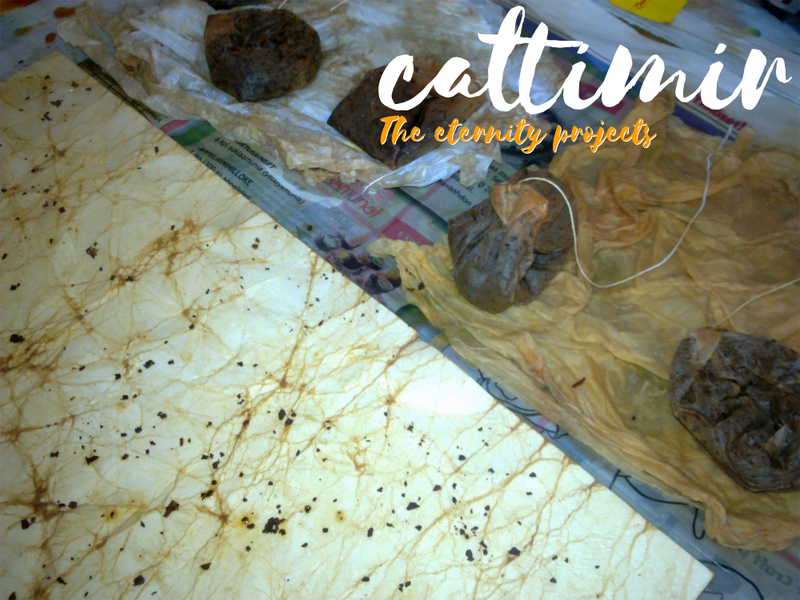 In the top left corner: The thin paper (140g/m2) was rolled and submerged into the tea kettle. Then it was left to dry without unrolling. BLACK TEA. 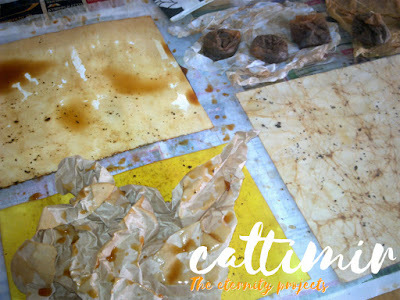 Top row: Thick watercolor paper (300g/m2) and tea bags on the napkin & tissue papers Bottom row: Crunched brown packing paper left to dry. Next to that, a crunched paper (210g/m2) unfolded and a laminated sheet placed on top of it (no effect occurred when dry). BLACK TEA. Two types of cotton strings and a wet tea bag. BLACK TEA. 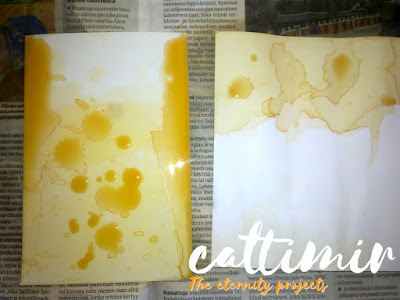 A cling foil was placed over the wet paper (180g/m2) and then left to dry. This had some nice effect. BLACK TEA. 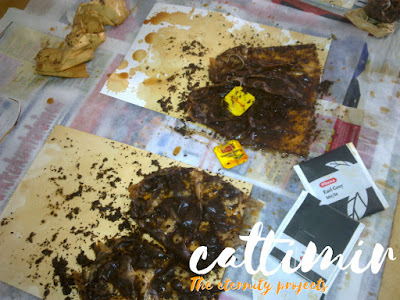 On the left the crunched paper with a laminated sheet and on the right napkin and tissue papers with tea bags. ROOIBOS & CHAMOMILE TEA. 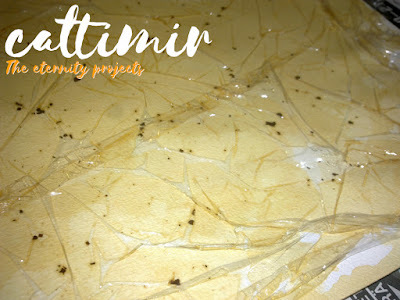 Brown packing paper was crunched and dipped into chamomile tea. Before leaving it to dry some tea was dripped over it. Below that is a bit crunched watercolor paper (210g/m2). It was first dipped into the chamomile tea and then some rooibos tea was dripped over it. ROOIBOS & CHAMOMILE TEA. On top is the same watercolor paper (210g/m2) as it is in the previous picture but with more rooibos tea on it and below that a Canson paper. The Canson paper was also first dipped into the chamomile tea and then the rooibos tea was dripped over it. Below that is the Strathmore paper. It was dipped into chamomile tea. It got some rooibos splatters on it by mistake. ROOIBOS & CHAMOMILE TEA. The mixed media papers (Strathmore & Canson). 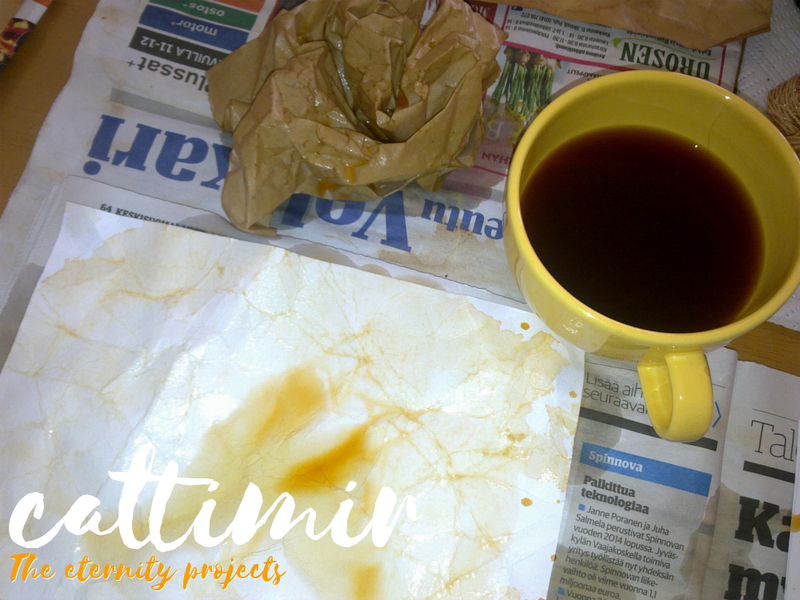 First some chamomile tea was flicked with a big brush and then some rooibos tea after the papers had dried a bit. The process with rooibos tea was repeated a couple of times. ROOIBOS & CHAMOMILE TEA. A photo paper (left) and the watercolor paper (210g/m2). Both papers were partly dipped into chamomile tea and then some rooibos tea dropped on to them. Below you can see the results. The papers were already dry when taking these pictures. The cotton yarn experiments. On the top are the original colors before dyeing with black tea (in the middle). The strings below are from different tea bags. The color from the chamomile was very light. I started dyeing with it when the water was still hot. Perhaps, if I had let it soak longer, the shade might have been a slightly darker. Not sure though... I might try it again sometimes later in the future. If I try again, I might also buy some green tea. I don't like green tea, so there wasn't any in the cupboard to use in this experiment. The black tea worked alright on some papers but I was hoping for more diversity. I guess I should have added more tea to the paper after the first puddles had dried. Personally I like the rooibos tea because it's more colorful than the other teas, it has that reddish tone. I already made three different backgrounds with the tea materials. You can see them in the picture below. For the first background, the one on the left, I folded a few Lord Nelson's tea bag paper packings. Glued them down using a glue-stick and brushed over with white gesso. The second background has some tea bags from Loyd's rooibos tea. The bags were torn from the edges when opening them (no matter if they were wet or dry). So while gluing them with gesso I ripped them more randomly, but I tried to keep the pieces as big as possible. Then I brushed it over with white and clear gesso. The third background has a rooibos tea stained kitchen tissue paper. 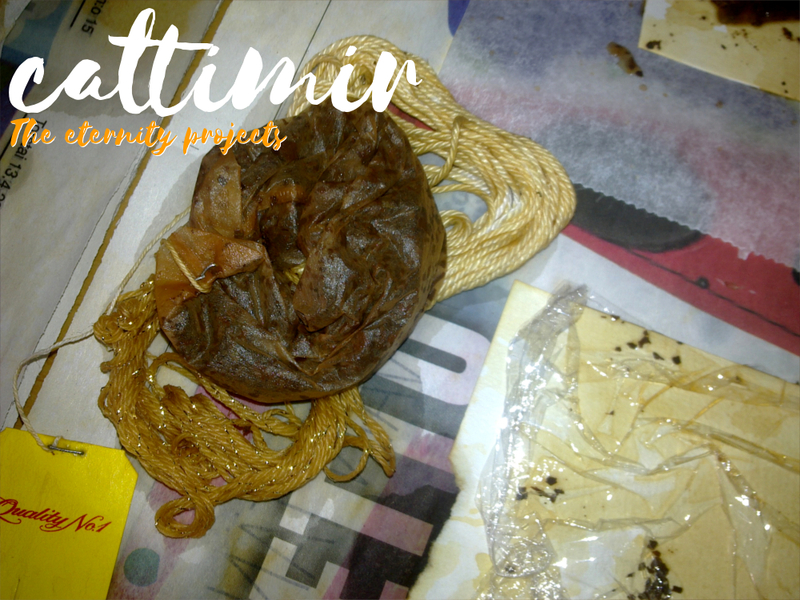 It was used under the drying tea bags. It looked kind of cool so I decided to use that one too. It also has some white and clear gesso over it. 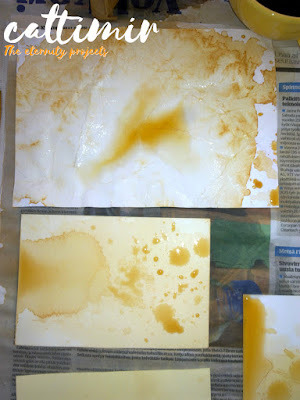 The rest of the papers from this dyeing experiment I will store for later use. Backgrounds waiting for the next phase.